Network directors, system administrators, automatic control system-specialists, specialists on electronic document exchange... People of these professions, by the nature of their occupation, need information on the enterprise network in various representations. As in many other cases, it is visualization of information that helps a specialist to simplify the process of decision-making. And that's where such a tool as ConceptDraw comes to aid. Why ConceptDraw, and what possibilities does the program provide? Smart connectors simplify displaying of interconnections among the diagram elements: once you have interconnected the symbols of the devices, they will remain connected even if you shift any of them. To display different network levels you can draw diagrams on several layers and show/hide layers according to your needs. Another variant of layer division that can be realized in ConceptDraw is creation of a multi-page document connected by hyperlinks. ConceptDraw objects allow to save arbitrary detailed information on the equipment in the user's properties of the object (Custom Properties). Rich possibilities for setting text properties, and ready-to-use background objects allow to beautifully design diagrams; the set of supported export formats (various vector and raster graphic formats: PDF, Power Point, Flash, HTML (with hyperlinks)) simplify the process of information exchange with your colleagues and business partners. A great step in (the degree of utility) of ConceptDraw was made after the appearance of ConceptDraw Basic — the in-built scripting language of ConceptDraw. The typical task for ConceptDraw Basic is to automate visualization of some data. This data can be obtained in the result of work of an arbitrary application (including ConceptDraw-script) and it can be saved in a text file, ODBC — compatible base or in one of the open formats supported by ConceptDraw. In the first two cases further on data will be read and outlined with the help of ConceptDraw Basic. In case you use a ConceptDraw open format (XML for ConceptDraw or XML for Visio) can open the obtained document in ConceptDraw, add design details and get a presentable diagram. Possibilities of ConceptDraw Basic greatly increase at using the script functions, which are exported by the shared libraries. Here are several examples on the ideas of automation that may attract specialists who plan and track functioning of computer networks. Planning a network for tracking information traffic with the aim of traffic localization you need information on the company structure visually displayed. 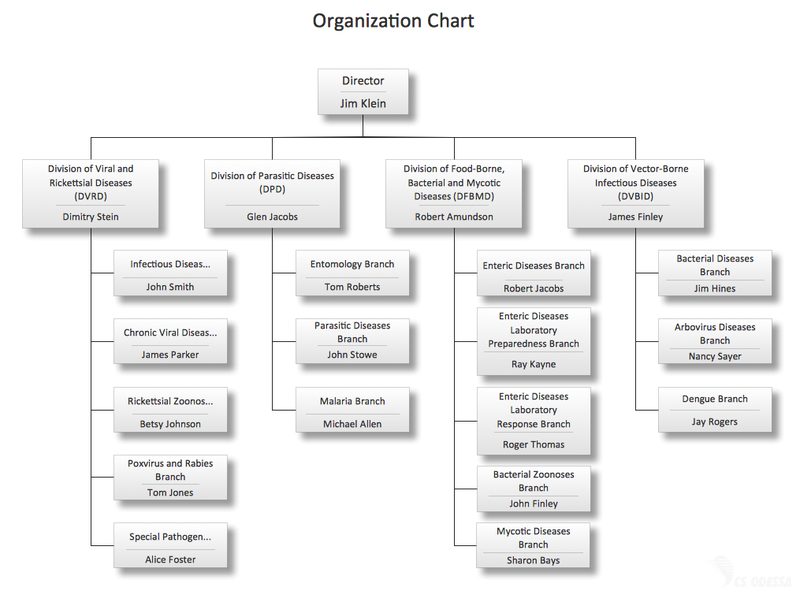 It can be presented, for example, as an organizational chart. In ConceptDraw DIAGRAM Organization Chart Wizard has been added, which allows to automatically build an organization chart of the company on the information saved in a text file or in ODBC-compatible database. In this case, any properties necessary for you can be saved by the wizard in the object custom properties. Collecting and outlining of data is done by the basic script. Besides, the function exported by the external library is applied to dialog-communicate with the user. Having created the network diagram on the level of the devices used and having assigned the cost of the devices in the object custom properties you can, with the help of simple CDBasic-script evaluate the cost of the solution obtained. Such a script can accelerate planning of the equipment for the future network or upgrading the existing one. 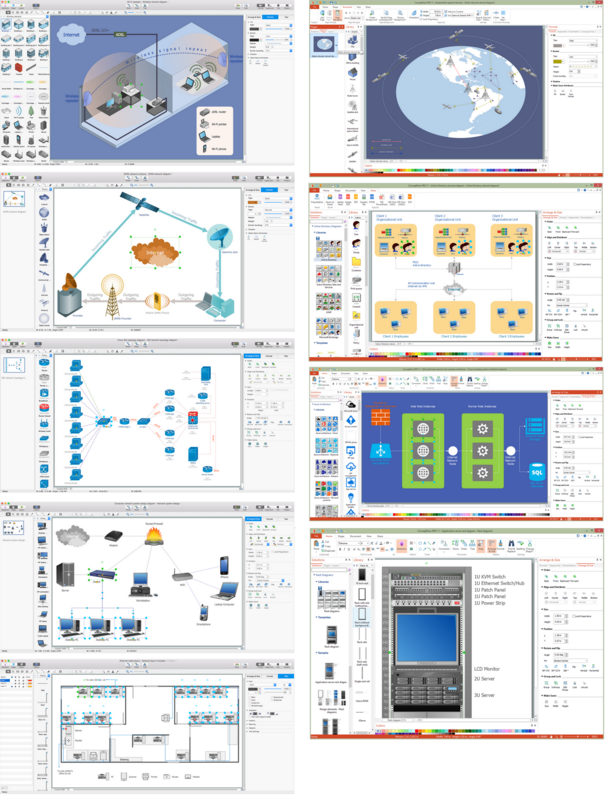 For users' convenience ConceptDraw library objects, representing the network equipment are already supplied with many typical characteristics (producer, serial number, premises...), but you can always add new ones, needed for a specific task. Note that in such a case there is no need in interaction between ConceptDraw Basic with the external libraries, as well as in temporary storing of information in some file or DB. Another variant is a solution which analyzes the status of the already existing network for the moment and displays shared resources available at this moment. For analysis of information an external function is used. The result of its work is XML-file with the data on the network structure. Further this file is read and outlined by own means of ConceptDraw Basic. 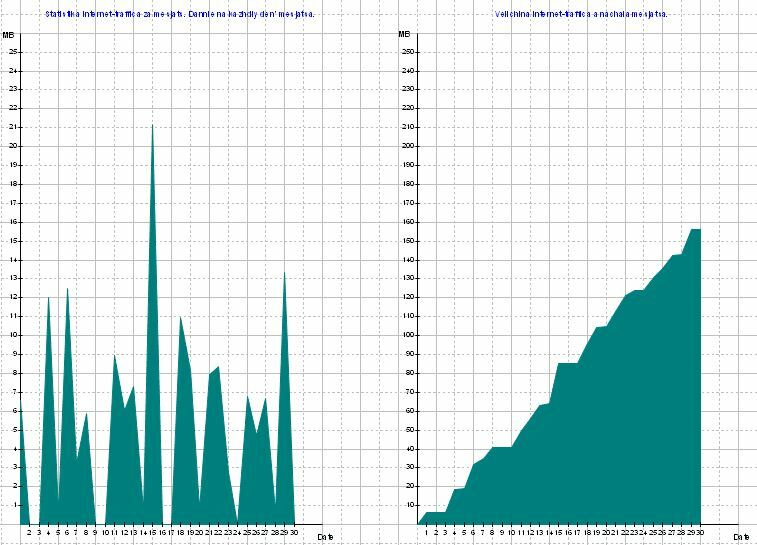 In the package there is also an example (it can be found in the file ...SamplesSolutionsDiagramingJointGraph), which builds statistic graphs of Internet traffic per month (for each day and from the beginning of the month). The data is read from the text file. Support of a number of open formats, the possibility of interaction with files and with ODBC-compatible databases and the ability of ConceptDraw Basic to call the functions exported by the external shared libraries opens wide opportunities for building most various solutions in the field of data visualization. Moreover, such subject field as planning and management of networks are capable of presenting a large number of tasks, awaiting to be solved within the given technology. Active Directory Diagrams — Document the structure of Microsoft Windows networks, Active Directory domains, Organizational Units (OU), and Exchange Server organization. Manage the controlled access to printers and files, access and security, network equipment maintenance and repair, and data backup, storage, and recovery. Azure Architecture — ConceptDraw teams up with Microsoft to bring the Azure Diagrams solution, a selection of Azure themed graphics and templates, allowing you to create effective Azure architecture diagrams. AWS Architecture Diagrams — The solution includes the icons Amazon notation suggests to be used when creating architecture diagrams describing your use of Amazon Web Services or Amazon Cloud Services. Computer Network Diagram — A comprehensive set of graphics covering all elements of computer networking. Create diagrams containing computer hardware, user inputs and communication devices. 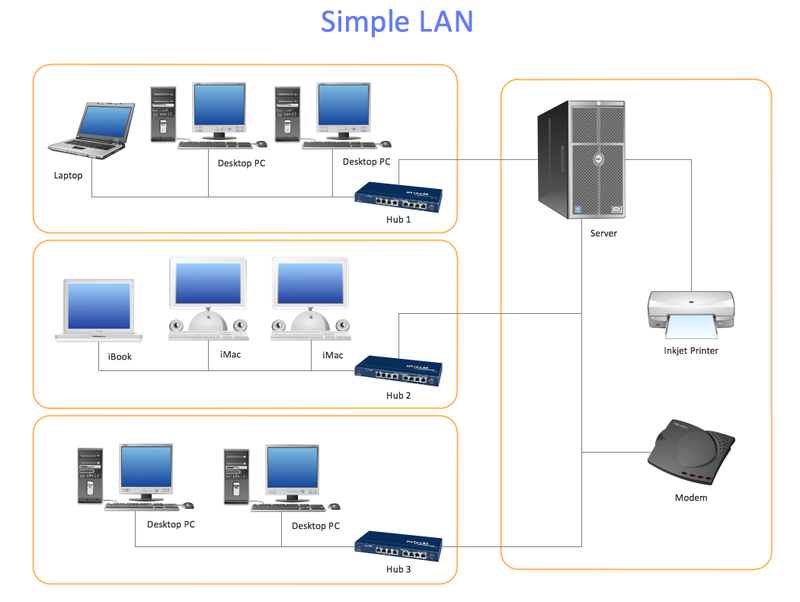 Cisco Network Diagrams — The Cisco Network Diagrams solution contains Cisco network symbols and icons to help you visualize computer network topology, equipment connections, and arrangement. 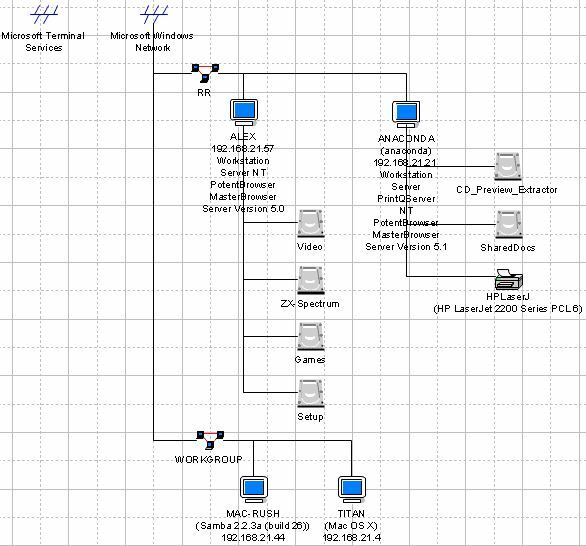 Interactive Voice Response Diagrams — Create a diagram that visualizes the logical structure of an interactive voice response system. A complex IVR system may have many different options available through voice recognition or button pressing responses - map them out with the help of this solution. Network Layout Floor Plans — This solution allows you to create a computer network blue print of your home or business. Create an overview of the connections between computers, modems and routers with a workspace. Rack Diagrams — A rack diagrams can visualize the rack mounting of computer and network equipment as a frontal view of the rack, with the equipment installed. You can decide the best configuration before beginning the physical task. Telecommunication Network Diagrams — Create a diagram depicting telecommunication on any scale. From call centers to GPS navigation systems, TV networks to satellite communication, wireless broadband to radio linking. Vehicular Networking — Show a variety of transportation networks, and their connections on a local or global scale. By boat, by air or by land; your drawing has no bounds. Wireless Networks — A solution with graphics relating to all aspects of wireless networking. Design or document the wireless network from your home or business.